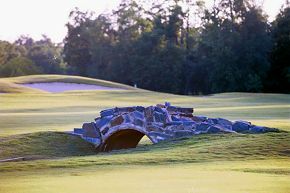 I've played Stonebridge 5 or 6 times in the last 30 days and it's been in really good shape each time. They mini-punched a couple weeks ago but the greens are pretty much back to normal - a little hairy as of yesterday but that's too be expected - they still roll true just have to put a little more speed on them. Prior to the punch they were rolling at least a 10 and true. Some of the "Gold" back tees are in need of some love but really only a couple are in need of repair. Exceptional golf course, exceptional staff, exceptional value. This and Carolina Lakes (At sun city) are my must plays right now.